Most folks don't realise that there are two versions / implementations of Flash: inside Chrome and outside Chrome. The one outside Chrome, with its lack of sandboxing is plain unsafe. Its uninstalled from mine and my families computers, and if we need Flash then we use Chrome. For OSX, here's the uninstall instructions. Friends don't let friends run Flash outside of Chrome. And finally, for Firefox, you should also run BetterPrivacy which can delete the sneaky long term storage cookies. 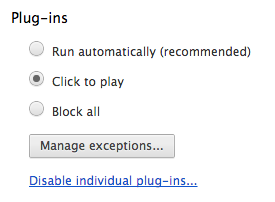 And finally, Chrome has a very handy "click to play plugin" feature. You should use it! In a Chrome tab type "chrome://settings/content", scroll down and change to "click to play"